Because this is a FWD transaxle, we have the additional task of putting together a transfer geartrain and differential. LEFT: The shaft & its lower bearing go into the case, and are topped with this baffle. RIGHT: A length of PVC pipe can be used to hammer the baffle & race down into position. Then we tighten the retaining nut with the washer to pull the transfer gear down onto the shaft. This seats the bearings against their respective races and lines up the transfer (driven) gear to the output (drive) gear. 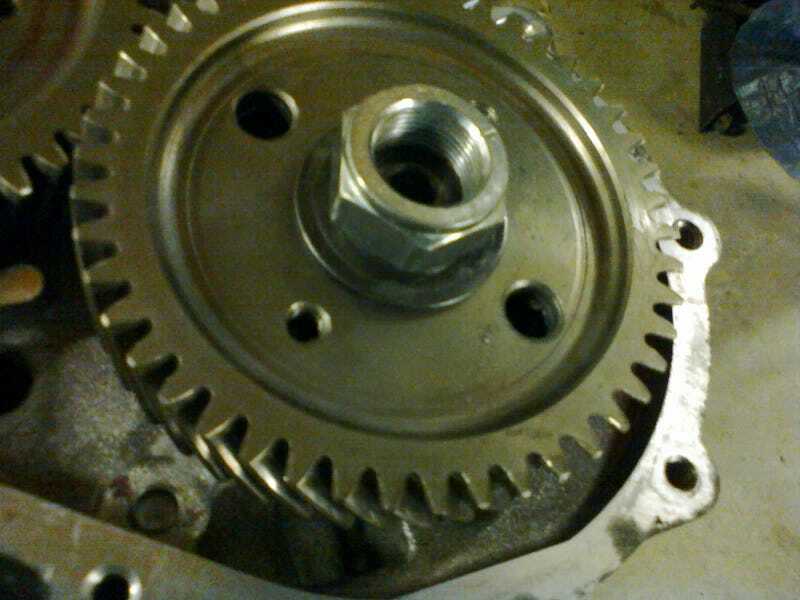 The ring gear is meshed with the transfer gear, and the carrier floats between the diff retainers. The rebuild kit did not come with a gaskets for the covers, and the instructions call for RTV anyway.